Take a look around your bathroom. What does it look like to you? Take a look around your bathroom. What does it look like to you? Obviously it looks like a bathroom, but does it reflect your style? Does it function to your needs? If you answered no to any of those questions, it might be time for a remodel. 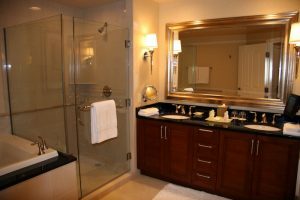 Here are a couple of reasons you should remodel your bathroom. Every household is different, and has different needs for their bathroom. If multiple people need to leave at the same time, try double sinks and a larger mirror. If someone in your home has mobility troubles, consider a walk-in tub. Add handles throughout the bathroom to make it accessible. Choose a tub with a textured bottom to avoid slipping. Do you have a Pinterest board brimming with clever and creative ideas? Try some of them! Create that gorgeous tile mosaic in the shower. Make the flooring heated. Opt for a warming towel bar. The sky is the limit! Maybe you saw a movie or a TV show that had a really cool bathroom that you want to mimic in your home. A claw foot tub is a classic touch. Add some luxury to your bathroom with a jetted tub. You can even get heated seat for your toilet! Maybe you bought your home as a “fixer upper” and the bathroom was covered in ugly tile, but you just never got around to getting rid of it. Maybe that old wallpaper border is starting to peel off from the years of steam. Whatever parts of your bathroom that you dislike, you can remove and replace during your remodel. Your new bathroom will reflect your needs and your unique style! This entry was posted on Thursday, February 15th, 2018 at 8:59 am. Both comments and pings are currently closed.